panel rehearsal the night before “A General Theory of Last Night”, Hilton Hotel, February 14, 2013. 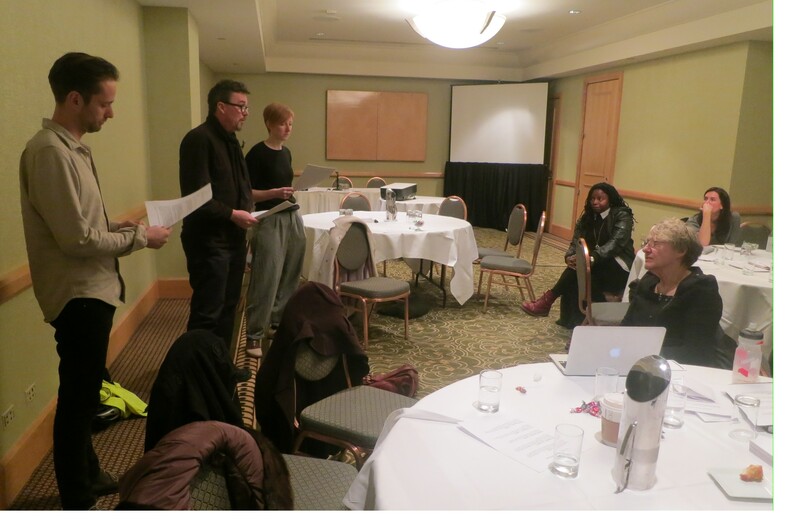 “A general Theory of Last Night: A Constructed Panel Discussion” was a scripted panel discussion written collaboratively in the context of the College Art Association Conference in New York on Februrary 15, 2013. A group of 10 participants gathered the evening before the panel to collectively script a discussion that tried to address some of the issues currently being discussed at the conference, identify topics of debate and articulate those positions in a clear and concise manner. The objective of this workshop was to provide a vehicle for immediate reflection and the chance to respond in an Op-Ed approach to current concerns. Participants were joined by professional actors who delivered the scripted content the following morning. Collaborating writers included: Michelle Levy, Adeola Enigbokan, Barbara Adams, Caroline Woolard, Hope Ginsburg, Tatiana Flores, Olga Kopenkina, Michael Mandiberg, Martha Rosler, and Pablo Helguera. The introduction and final edited version of the text were made by Pablo Helguera. The panel was performed by actors Kevin Scullin, Melissa Chambers and Richard Saudek. Good morning, and welcome to a General Theory of Last Night. My name is Kevin Scullin. and we all are actors. We are being asked by the script I am reading to say that we are professional and renowned actors, which we are. The authors of today’s panel discussion want to thank the College Art Association, including Daniel Lemakis and Lauren Stark, for their generosity in allowing this sort of intervention under the academic auspices of this conference. Similarly, we want to thank Mark Tribe, who invited Pablo Helguera to propose a new format of refection during this conference, and who in turn has invited a number of collaborators to write this panel, which has led to what you are about to see and hear today. The collaborators who wrote this text last night were Michelle Levy, Adeola Enigbokan, Barbara Adams, Caroline Woolard, Hope Ginsburg, Tatiana Flores, Olga Kopenkina, Martha Rosler, Michael Mandiberg and Pablo Helguera. Or that we didn’t operate under full awareness that it may be impossible for us to convince you that we tried to avoid irony. Our aim is perhaps more difficult, more ambitious, more idealistic, and less connected to any particular conference. Environments where, either by whether desire or need, we subject ourselves to many viewpoints but mainly many expositions, mostly microscopic in scale, a wide range of expertise that covers the entirety of art history from prehistory to, in this case, last night. how to synthesize effectively and in a way that actually bears some relevance to the world we live in today. If we agree that the most consequential art that is made at any given time is so because of how it grasps and defines the time in which it was made, then it should naturally follow that the art historical profession should operate in the same way. That is, on the long view of the immediate. And yet we usually are left with excessively detailed information, with little time or energy or help to make sense for all of it. The second lingering question tends to be: when does art history start? Indeed: when does the immediate past turn into the past, which turns into the landscape that is distant enough from us to start giving us meaning? When do we start historicizing, and when and under what conditions can we overhistoricize? And isn’t it the case that in the age of the 24 hour news cycle this relationship has changed? Indeed, isn’t it true that the day after, say, a major biennial opens its already history? And isn’t it also the case that we always appear to be utterly unprepared to understand that fact? Could we join the depth of art history with the efficacy of journalism? For that reason, we believe we need to reimagine the process by which we understand and relate to the immediate. Not with the objective to quickly discard it, but on the contrary: to think of it intelligently and sensibly, and prevent this seemingly inevitable tendency of immediate detachment to take hold. This is the premise of creating a general theory of last night. It is less an attempt to fix the transient in a permanent vitrine, and more an impulse to make the sense of that which has immediately transpired with our own logic and our own articulation, before others come and do it for us in the future. And to contest, at the very least, that need for synthesis that we need on a daily basis to move forward. And now, precisely because we are talking about the idea of immediate historization, and because this is in essence an art history conference, the writers of this script have proposed that one of the subjects we put to a debate today is on whether there are definitive views of art history. In museums, for instance, we often see examples where a particular history is told in what may appear “definitive” ways, where a period is given a final, “definitive” reading. For many of you this is an old and perhaps annoying problem, known as the center-periphery problem. We first need to say that this obsession with the definitive history is not particular exclusively to Art history. The Royal Geographical Society, for instance, has the same tendency to want to write definitive histories, histories that consistently leave out the periphery. I want to start by saying, in broad strokes, that the ubiquity for the last thirty years of the conundrum center-periphery has become more of a career opportunity for academic papers than a real debate. The reality is that the producers of canonical narratives have already recognized for many years that alternative histories, that is, for instance, alternative modernisms, need to be recognized, but they just can’t be incorporated cleanly into a single narrative. I don’t think there is such lack of awareness, nor is the comparison very useful right now, really, come on. The issue, and you are proving my point, is that the most important thing is that the center never has to respond to the questions of those outside of the canon. I don’t even know what we are debating. Ok, let’s bring up the most recently reviled case in point; Ken Jonson’s review of the Now Dig This! exhibition at PS1, where he theorizes that black artists are just imitating the art of previous white artists. first of all, Ken Johnson is not even worth dignifying with a discussion. he is the most extreme and substandard intellectual example you could come up with. Ok, let me try something else. As Australian don’t you think you are in the periphery? Do I feel culturaly periphreral? No, because Australians are the most well traveled people in the world . But do you like it when people are indifferent about what may be happening, for instance, in the art scene in Melbourne? it is a great art scene there. But nobody knows it. I mean, no one outside Melbourne I guess. So why should I care about the art scene in Melbournes if I don’t have to travel outside of New York to see great art? The point you are trying to make, If I understand correctly, is moot if you are talking about contemporary art. Today great art is hard to hide; it is on the web, it can become viral in second; curators travel all over the world to put art in hundreds of biennials, the strangest and more exotic the better. The problem with canonical modernist narratives and the attempt to incorporate alternative modernisms to it is that, if you are trying to tell the history of abstraction and you go to, say, India, you will have to go to the 1950s to find paintings made in the spirit of early modern abstraction. And in that case, is that an accurate call to make, to exhibit that painting next to paintings from 1910, or do you exhibit it next to Ab Ex paintings from the 50s? Doesn’t that do a disservice to that Indian art work? The real issue is on whether there should be a canon at all. That there simply needs to be multiple stories. but I don’t think anyone is questioning that. What does it mean to be left out of the canonical history? But actually, let’s go back to the question: Can we have the hubris of definitively state the history of a particular artistic movement? i wouldn’t define it as hubris but there is something to be said about the importance of the clear narrative. It is the clear narrative versus the messy truth. What is a clear narrative and what is a messy truth? Well the MoMA canonical story down the street, the story told by Alfred Barr, is a clear narrative, beautifully designed. It was a visual argument that led him to choose Cezanne and post-impressionism in a defining line with a whole an neatly packaged genealogy of artists. I guess I agree that the canonical narrative may be too neat and that the world is too messy, but where do you find accuracy, I mean, truthful stories, in that mess? So you are into fictional narratives? No! Gosh. It is not about telling lies instead but that there is a fundamental fallacy in “telling a true narrative”. Because you are constantly mistaking your model making —that is, your whole methodology— constantly tweaking it but mistaking it to the world itself. That is only if you are a bad curator. I don’t think that what I am doing when a curator is curating he or she is “producing truth”. He or she is producing models to which people can reflect. So if the model you are presenting has lost resonance, if it doesn’t feel exciting, if it feels boring, its because it has ceased to function as a model. But — I am sorry— the canonical modernist model has not ceased to function. Why do so many thousands of people go every day to see Picassos and Cezannes and all that? Well, those have become familiar narratives, stories we recognize and believe we understand and maybe even embellish and we feel rewarded when we can tell them to others. but here is a question: if I am not part of them, if they don’t concern me, if i live in another part of the world, why should I worry why they are important? Because they have the most exposure and what gets the most exposure dominates what gets discussed and thought about. OK, help me here. I am a bit lost on how the dots connect. Excuse me if I digress. But I went from Kandinsky to a fan on a rope! How the hell is that a narrative in any way? He’s got 19 years of pollen on the floor…. And there’s that installation, the clock, is the clock still there? Does it all fit into one neat narrative? Kevin, that’s contemporary art. We were really talking about modern narratives. It really is like apples and oranges. No, its ok. Point taken that narratives can be arbitrary, and an institution that commands attention has a responsibility to represent… they need to recognize their power and whatever they represent it is taken as good and represent what exists in a more comprehensive manner. But what if people ONLY want to see Water Lilies and van Gogh? What if the demand is for the more conventional art? And I am not talking only about the center here. Well, institutions could admit their own reality, which is that that’s what they are doing, that they are supporting that they have to command some power, to open their process, to detract from this idea, because that is what power does. You seem to be saying that now it matters what institutions do. Before you were saying that why does it matter to me what a big institutions do if it doesn’t concern me. No, I was the one who said that why should, say, people in Latin America care about what the big museums in New York or London do. My point is that they are always asking about themselves and sometimes it is not about you. They try to spread the word but that is another act of hegemony, you don’t get enough from the center so you can have more of it, like McDonalds… while there are other artists that are completely ignored, it is the same canon, these figures are exceptional it is an universalizing narratives. But where are these mystery artists? Where are they hiding? In the local art scenes. Ilya Kabakov was not the only artist in the 80s in Russia. It takes a scholar with a lot of patience to go and dig out that stuff. Or however power gets exported to other sites, but that artist work has to be packaged into something that can work in relationship to the existing discourse of processing of new and different information. sorry, i didn’t understand a word of what you said. I mean that the artist’s work has to be entered somehow into the center as a representative example of the outside, while the centers look for art that offers a distinction but also in harmony with the established canon. But they are connected, they keep growing, they are never affected. You confuse hype and quality. Something that gets hyped is neither a messy truth nor a neat narrative, its a messy lie. Art history is a messy business, I guess. What does autonomy mean today in art making? How can or should institutional frameworks support autonomy, and when do they compromise it? To me the most important question is: Does institutional affiliation compromise a radical agenda? Funding, a title, a job…. What about artist affiliations? The world doesn’t care if you don’t have a job as an artist. In the case of artists it may be a commercial gallery. I believe, like in the tired discussion we had on periphery, that this is dichotomy is not helpful to understand the real problem, which is on whether it is possible to create new models of autonomy. It is a problem that I would term a problem of “housing”. If you are trying to invent a new model, it needs to be housed in some shape or form within a certain institutional framework. If you are trying to invent a new model of what? What stands to be gained or lost by ‘housing’? In Vancouver, for example, affiliation meant artists collective groups… all are funded by the state; none of them question that. All are very well funded. On the surface, you may consider that autonomy, but these are not independent nor self-sustainable groups. They are dependent of the state. Do you think you can be outside of a system? What is autonomy? I feel independent when I feel I have free reign to do whatever I want 2/3rds of my time. But the fact that you feel independent doesn’t mean that you are— you are still tied to a system. I feel independent because I am, because within the system where I live, whatever I do in the form of art or other things is valued by people. They may buy it, etc. I don’t know how I would call it. You may want to frame it as independent practice. I wouldn’t regard, for instance, participating in the academy as an independent practice. The academy curtails your momentum, it makes you lose your autonomy. I am sorry but that is a disingenuous statement. The academy can give you equal or more freedom to create than the art market. How could you say that you feel free because people buy your art but you can’t be free because you have a teaching job? I don’t mean you, but Richard. I didn’t say that either. Yes Richard you did say it. Look, its here, clearly written, in the script. Oh. Did I? Oh well then. But I did not mean that I am free because I just sell art work. It is not about money. Let me put it this way. How does one get what one needs to get one’s goals done? You have an objective, how does it get realized? I am for creating my own ship. I don’t believe in working inside or parasitically inside an institution. You are just taking a very reductive interpretation of what an institution is. An institution is not just a university or a school. An institution is the art market, the art world…. Take for example the Occupy movement in the Berlin Biennial. That Biennial was really panned, right? This biennial was highly criticized by practically every participant, inside and outside. There was the disingenuous idea that the so-called “occupation” of the Biennial would give some credibility to the institution. In the end it was a situation where both the Occupy people and the biennial lost credibility due to the toxic relationship they created for each other. It is a perfect example of how there is no “outside” possible. Which brings us back to the question we started with: What is autonomy? What compromises your mission as an individual, what compromises one’s ethics? I don’t think that example of the Berlin show is a fair representation of the problem. There are many artists and collectives that maintain independence and credibility. For example, if you do projects where you create your own space, you create culture, you create a temporal reality. You don’t need to exist within the context of a biennial or museum to do that. If you are willing to accept work without pay, you can create a culture where people find out about it slowly, refine that meaning as a group. But how long can that last? How long until you need actual money, when you need to pay the bills, when you are tired of simply surviving and you get older and you need more security? You know what I mean? I’ve never been anti-money. There’s always a question of what one has to do to get level of funds needed to pay oneself. And how do you find funds? If you work within a collective, generate power within the collective, redistribute your privilege within the group. It takes a lot of trust, commitment to group, internally share skills, opportunities, so it doesn’t just exacerbate privilege internally to power. But the reality is that the idea of being fully autonomous or outside market is ridiculous. Mutual aid, trust will always exist in regards to market, and THAT is an institutional framework. Maybe then, if entire autonomy is impossible…Take Bell Hooks: isn’t Bel Hooks both an academic and an independent radical? Where do you place her? Perhaps I have been misunderstood. I don’t mean to say that because a project is “housed” in an institutional framework it is meaningless or can’t be radical. There are benefits to being a parasite of the academy. That is an ugly word. Doesn’t sound so beneficial. Call it however you want it. Many successful art projects are attached to the academy. Does that disqualify them? No. Is there a marginalizing effect? Not necessarily. Are artistic projects connected to a university seen as being instrumentalized by university? Does academic affiliation imply a kind of loss of agency of artist producer because of dependence? No. I am just saying that we should not pretend that those affiliations don’t exist and that they are things one can ever escape from, but by the same token one can’t just simply dismiss aything that comes from the institution simply because it came or is attached to some kind of institutional framework. I suppose that if you are happy working within those frameworks, that’s great. If you think you can make a run of the gallery market, then try. If you lack the Chuztpah or have different politics, or make work that’s not going to sell, then its important you find a way to pay your rent whereby they have the time to continue making your work. Theres a lot of different ways to do that. But no matter how you go about it, you will have to work mercenary jobs to subsidize your practice. I think that we seem to agree, in any case that there is a place for radicality in every framework, even if we don’t agree if it is possible to escape institutional frameworks. That it is possible to have the power to become invisible and not name our practice outright… but simply accept the framework you are given and subverting it slowly, subtly. I don’t question that, for instance, some teachers have made a whole career about talking about race and class in classroom, acknowledging other forms know not valued traditionally, teaching work songs, etcetera. But my point is that instead we can just reject spaces where they’re normally upheld. I don’t know how many artists would say ‘my practice is my teaching.’ Don’t you find this complicated? You guys… you guys change the subject all the time. This is the thing: you will always find an institutional framework if your mind is institutionalized. It is like colonialist thinking: the only thing that is worse than a colonialist mind is a mind that is colonialized. So naturally you can’t see outside of the institution. It is a scary place. It is difficult as well to see and practice outside of the art market, out of object production. I am glad that you brought us back to the beginning. Perhaps this is where the various subjects we discussed somehow merge. We started talking about the need for immediacy of history, that prompted this scripted panel, we spoke about messy truths versus clean narratives in art history and about the “housing” bubble of institutionalization and artistic autononomy. I actually object to this format of the scripted panel. its too constraining, and you can’t come up with meaningful stuff the night before, and it symbolizes all that is wrong with what we talked about in terms of narratives and autonomy. Ok, let’s be serious now. I do think that there is something important to be said in regards to the relationship between art history, autonomy, and our need for clear narratives. we are always told “the truth shall set you free”. But what happens when there is no final truth? Not that. There may be freedom, but it may consist in the recognition that there are no final truths. that is too relativistic. I believe we can aspire to specific truths, but they won’t be clean, they may be messy. freedom is a messy business too. we aren’t always free to say what we want. today was a case in point. but there is certain freedom in following a narrative that someone laid out for us. Could we say that messiness will set you free? I am not in favor of chaos. I think you can create beautiful untidyiness, a state of things where all gets contaminated. let us be contaminated then. And since there is no final truth, there is no final end to a conversation. The conclusion then is: see you next year. We will not quit talking about this. Thank you so much for your time. And now, we will proceed to the Q+A portion of this panel. Because we are actors, we have no idea how to answer any of your certainly inspired and pointed questions, so we have been provided with a list of answers from which we will simply pick whichever we think may be the best possible response to whatever answer you wanted to make. We will take three questions at most.